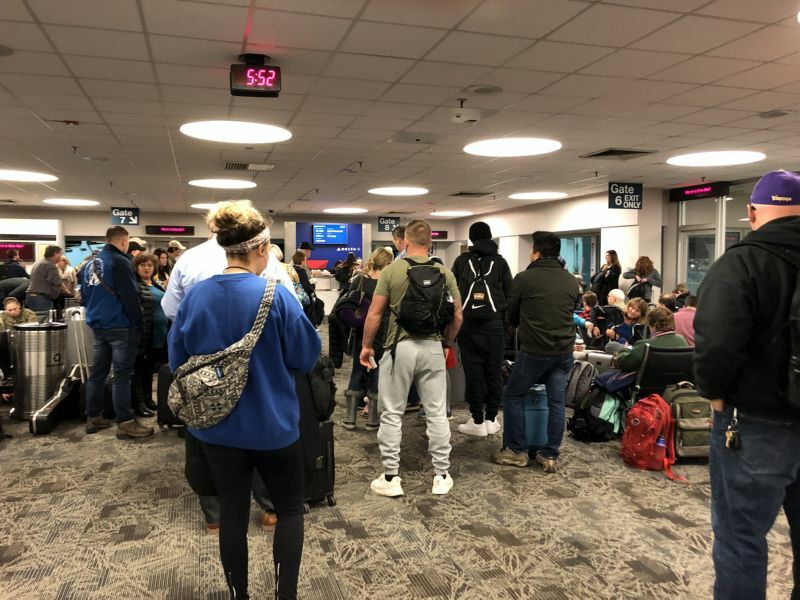 This week, Delta began mass implementation of their new, new, new boarding zone system that was allegedly designed to load planes faster, reduce gate crowding, make more sense to the average flyer, and keep everyone happy. Nice try. Delta is 0 for 4 by my calculations. Very typical of Delta: It’s 8:43 am and the boarding (scheduled to start at 8:25 am) has not yet begun. But, of course, the gate is packed with gate crowders. First Class and Diamond Medallion. Those traveling with small children. Let’s be clear, if you’re holding a “Main Cabin 1” boarding pass, then you’re not a frequent flyer on Delta (otherwise you’d be Sky Priority). This means you have no freaking clue that you’re actually the 7th zone to load! Think it’s bad for those holding a Main Cabin 1 boarding pass. Imagine those in ZONE 10 – that is, those holding a pass that just reads “BASIC” under their seat assignment. It doesn’t even use the word “zone,” it just says BASIC. What does seeing “BASIC“ printed on your boarding pass even mean to someone flying in Basic? Those who purchased the lowest-priced seats on Delta are often not frequent flyers, they’re just folks trying to get from A to B as cost-effectively as possible. Call it ZONE 10 for the love of God!!! In larger airports like Atlanta, they have room for the expensive signs they’ve purchased – and I’ve noticed these do clear a path to the gate for the premium flyers. The signs also appear to reduce the confusion that some Zone travelers had in the past. That is, am I in the first group to board since my boarding pass reads Zone 1? The Delta Boarding Zone stanchions in Atlanta. 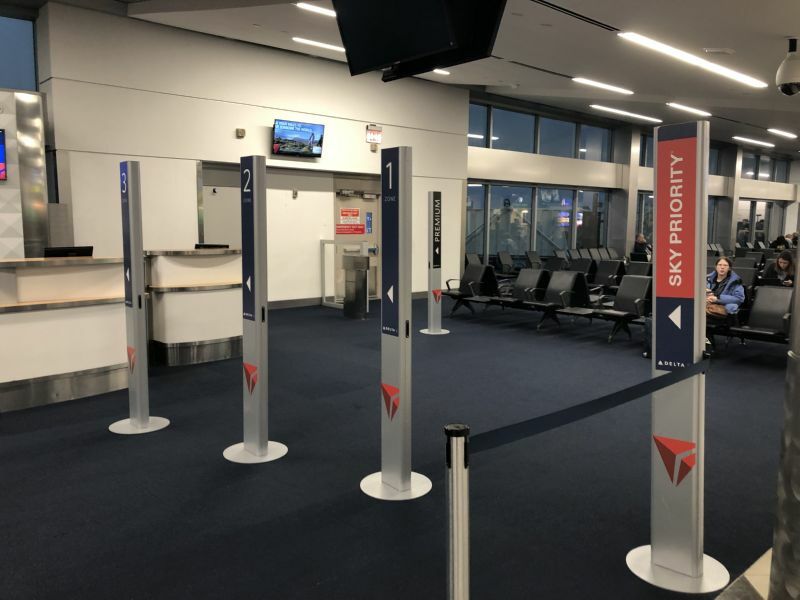 Though Delta certainly can’t put these stanchions at every gate – plus, these do nothing to alert those holding a BASIC boarding pass that they need to stay seated for about 20 minutes while we load everyone else first. Why not just give every Zone a number – 1 through 10? This would eliminate the ropes, stanchions and signs Delta continues to experiment with. It would alert those in the later groups to board that they don’t need to stand up right away and block the gate area. 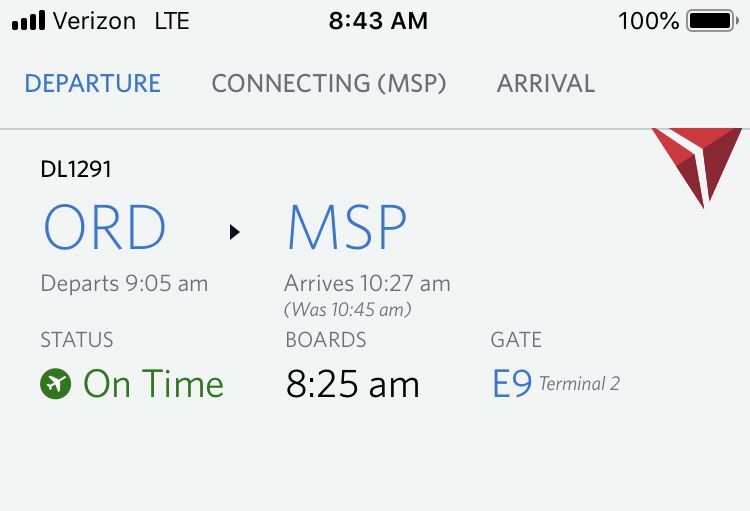 Are numbers just too “old school” for Delta? Are they just too efficient? I’m starting to hear grumblings from my friends who’ve been staunch Delta supporters in the past. Delta is starting to piss off lots of their most valuable customers. The changes they’ve made over the last few years – like reducing the number of First Class seats on many of their planes (which translates into fewer upgrades for Medallion Members), creating Delta Comfort+ (a relatively expensive way to get a tiny bit of leg room and usually just one free drink), and pushing Medallion Members down in the most recent boarding process are causing some business travelers look for alternatives. Plus, this new, new, new Delta Boarding Zone System will certainly create even more anxiety for the casual flyer – someone who just spent more to ride in the cheap seats on Delta than they would’ve paid on Southwest, they spent money to check a bag that would’ve been free on Southwest, their ticket was nonrefundable (unlike with Southwest), and they got treated like cattle when it was time to board. Why would they ever fly Delta a second time? Creating a great customer experience is not that hard – unfortunately, some executives like to justify their worth by developing convoluted plans instead of opting for the simple; the sensical. In an effort to make First Class and Comfort+ passengers feel even more special, Delta created a nonsensical, big pile of crap for the rest of their customers. The short answer, at least for Delta, is they can’t. The back of the plane is where the cheap seats are; and because they charge extra for checking a bag, that can’t have those people sitting in the cheap seats filling up all the overhead space. Plus, with their ever-devaluing Medallion statuses, they’ve got to throw some crumbs to their frequent flyers.